Next Stop.....the World! : Go Fiji Go! Growing up in the good ole US of A, watching the Olympics is something fun you do every 2 years. You don't really worry if any Gold will be brought home, you just wonder who will be bringing it home. 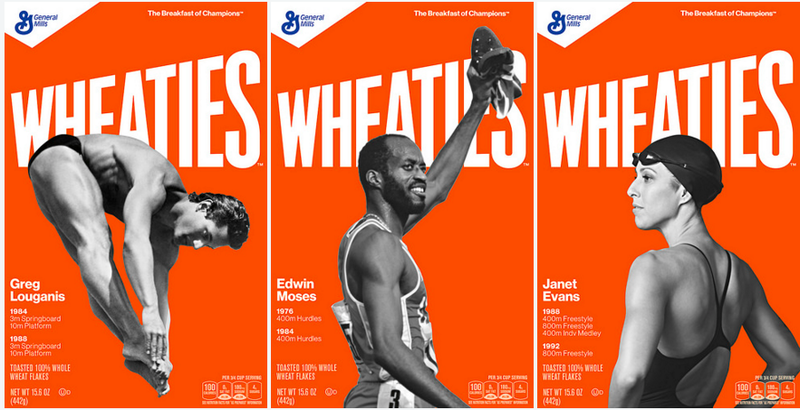 Who's face will be plastered all over that Wheaties box when you go the grocery store in the coming months (though I have to say, I have never eaten Wheaties). 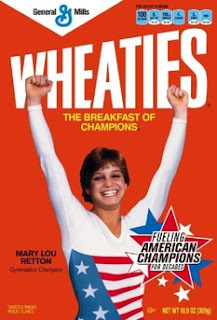 You watched to see how sparkley the gymnasts uniforms are, the cool dives the divers do....and whatever the winter olympic people do.....(oops, I guess you see my interests...lol). This Olympics have been eye opening for me. 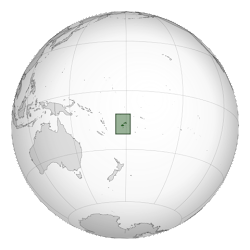 Living in Fiji, a country that has only participated since 1956 and even then only in 12 Summer and 3 Winter games (btw, all these little facts are from Wikipedia). Of those times participating, up until this year's Rugby 7s, only 2, TWO, of the athletes participated by qualifying (as oppose to wild card). I even noticed Matthew McConaughey picked the US game against Fiji to be the one he saw! 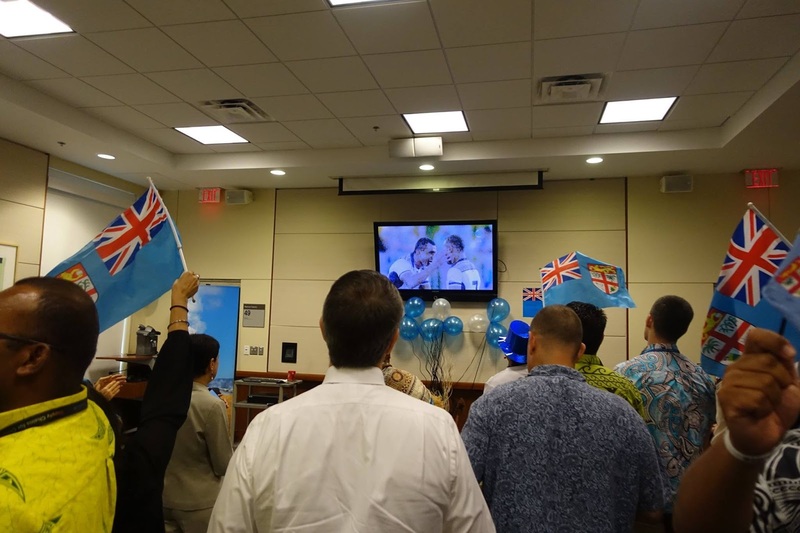 I bet he's secretly cheering Fiji on! 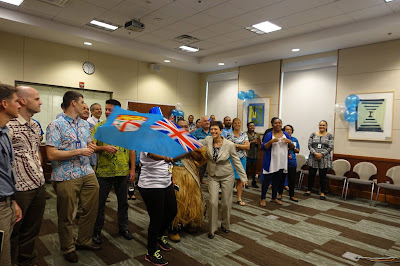 So needless to say, the country spirit here in Fiji has been quite invigorating! Everyday this week during the Rugby matches, the kids have gone to school multi-purpose hall to watch the games as a school (they are only 20 minutes long, so not much lost education....lol). A local TV station made this video which has been playing on TV (and the song has been playing on the radio). Richard got up at 5:30 this morning to watch the game. He could hear the neighbors outside cheering when it was over! 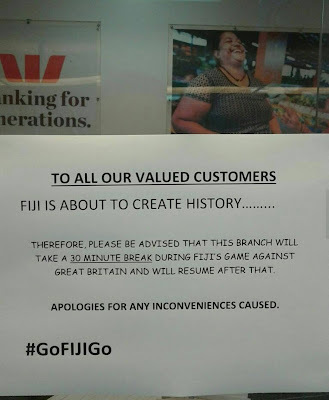 A local bank even closed for the final game....LOVE IT!!!! As soon as Malika got to our house, she asked if it would be okay if she watched the game, I pointed to our TV (which was already on and the Olympics tuned in) and said "yes, I have it ready to go!" We watched it together. Richard watched it with his co-workers at work. Here are the photos they posted on the Embassy's facebook page. 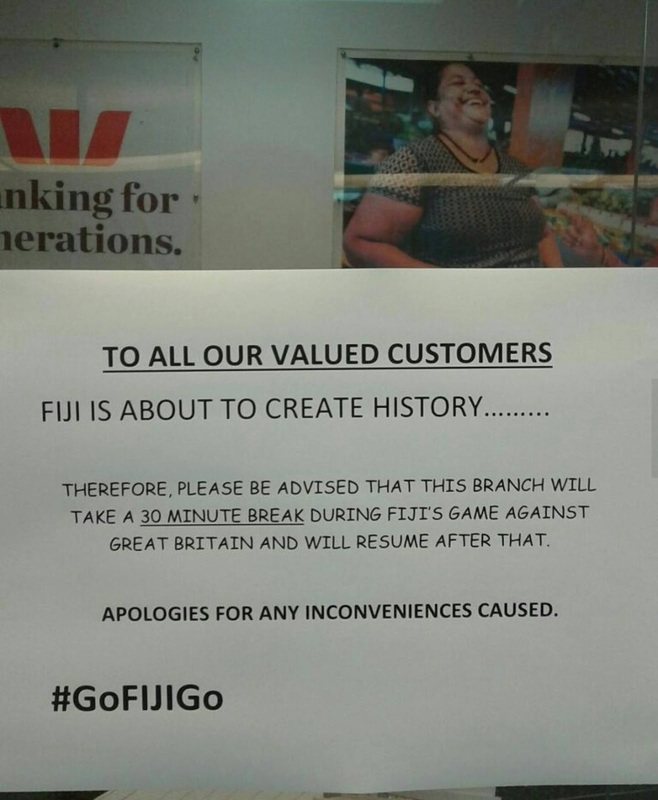 Going into the final game, the team had won Fiji's first Olympic medal. 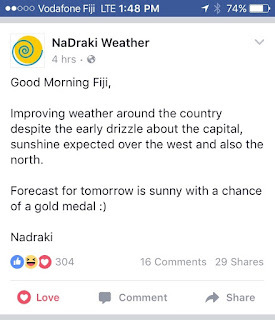 In talking to Fijians though, they needed to bring home a gold! Anything less was unacceptable! 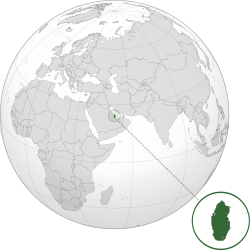 (This article confirms that). That is just what they did! It was a great game, I loved a commentator's remark about them being the Harlem Globetrotters of Rubgy....they made Great Britain look like they had been practicing for the wrong game or something! 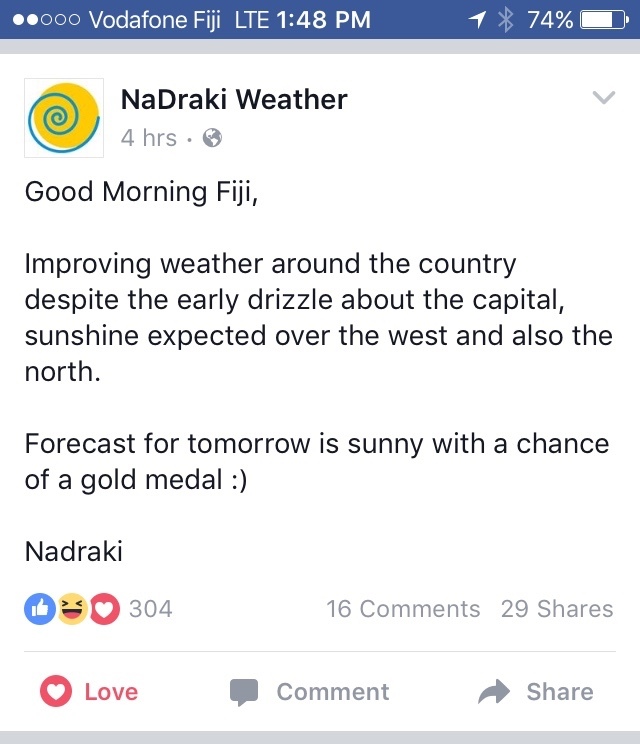 For a country that had been ravished by TC Winston earlier this year to have a team not only win the country's first Olympic medal but have it be the gold everyone wanted. Congratulations! I have never in my life cared about an Olympic event so much nor been so excited when the team I was cheering for win (which ironically isn't my country). Driving around town, everyone is waving their flags, honking their horns, and cheering. Here is a video a friend of mine got. Edited: Public holiday has been declared! 22 August 2016 will be the day to honor the team and celebrate their win! 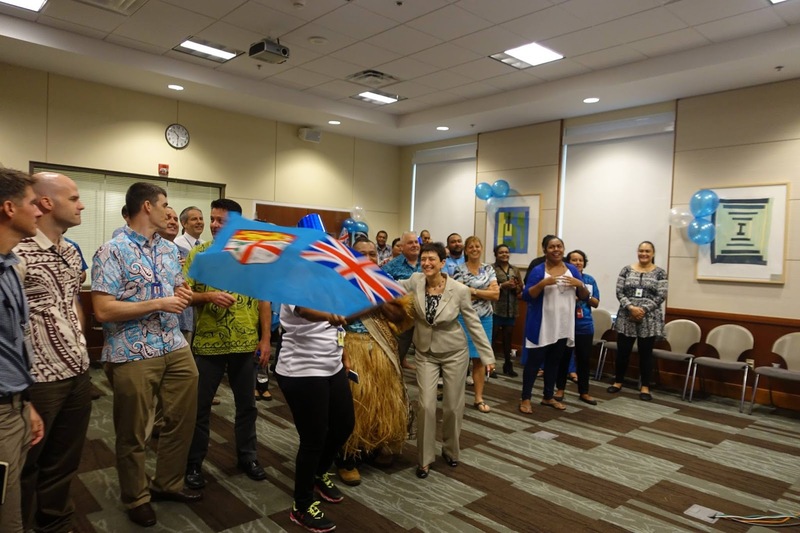 Congratulations Fiji! What exciting times to witness victory along side!